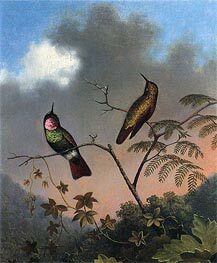 Martin Johnson Heade (August 11, 1819 - September 4, 1904) was a prolific American painter known for his salt marsh landscapes, seascapes, portraits of tropical birds, and still lifes. 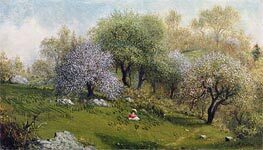 His painting style and subject matter, while derived from the romanticism of the time, is regarded by art historians as a significant departure from that of his peers. 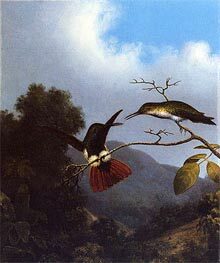 Art historians have come to disagree with the common view that Heade is a Hudson River School painter, a view given wide currency by Heade's inclusion in a landmark exhibition of Hudson River School landscapes at the Metropolitan Museum of Art in 1987. The leading Heade scholar and author of Heade's Catalogue raisonne, Theodore E. Stebbins, Jr., wrote some years after the 1987 Hudson River School exhibition that "...other scholars myself included have increasingly come to doubt that Heade is most usefully seen as standing within that school." According to the Heade catalogue raisonne, only around 40 percent of his paintings were landscapes. The remaining majority were still lifes, paintings of birds, and portraits, subjects unrelated to the Hudson River School. Of Heade's landscapes, perhaps only 25 percent were painted of traditional Hudson River School subject matter. Heade had less interest in topographically accurate views than the Hudson River painters, and instead focused on mood and the effects of light. Stebbins writes, "If the paintings of the shore as well as the more conventional compositions...might lead one to think of Heade as a Hudson River School painter, the [marsh scenes] make it clear that he was not." 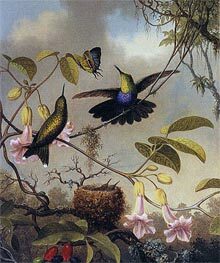 Heade was born in Lumberville, Pennsylvania, a small hamlet along the Delaware River in Bucks County, Pennsylvania, and spent his childhood there. His family owned the building in which is now The Lumberville Store and Post Office, the village's sole general store. Historians believe he received his first art training from the folk artist Edward Hicks, who lived in the area. By 1839 Heade had painted his first portraits and two years later had exhibited his first work at the Pennsylvania Academy of the Fine Arts in Philaldephia. 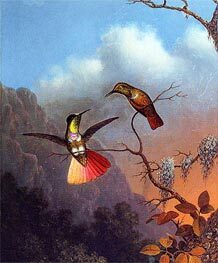 Through the mid-1850s, Heade made his living as a travelling portrait painter. 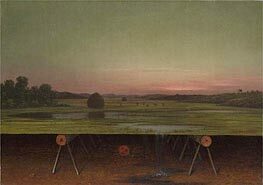 Around 1857 Heade became interested in landscape painting, partly through his meeting of established artists John Frederick Kensett and Benjamin Champney in the White Mountains of New Hampshire. 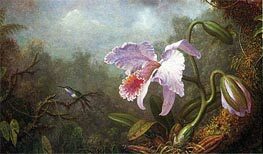 Heade moved to New York City and took a studio in a building that housed many of the famous Hudson River School artists of the time. He became socially and professionally acquainted with them, and struck up a particularly close friendship with Frederic Edwin Church. 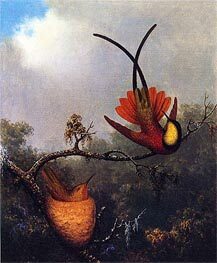 Heade's interest in the tropics was piqued at least partly by the impact of Church's monumental painting Heart of the Andes (1859), now in the collection of the Metropolitan Museum of Art. 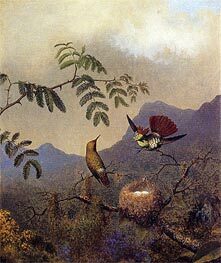 Heade travelled to Brazil from 1863 to 1864 to paint an extensive series of small works, eventually numbering over forty, depicting hummingbirds. 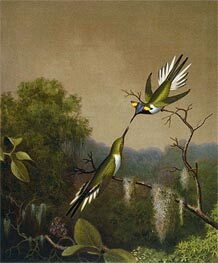 He intended the series for a planned book titled "The Gems of Brazil", but the book was never published due to financial difficulty and Heade's concerns about the quality of the reproductions. 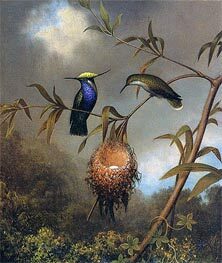 Heade nevertheless returned to the tropics twice, in 1866 journeying to Nicaragua, and in 1870 to Colombia, Panama, and Jamaica. 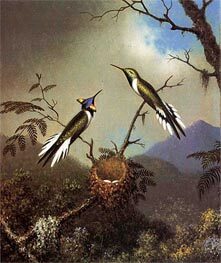 He continued to paint romantic works of tropical birds and lush foliage into his late career. 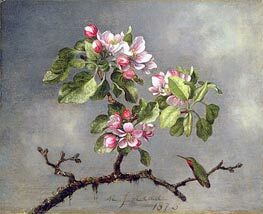 During his later years in St. Augustine Heade also painted numerous still lifes of southern flowers, especially magnolia blossoms laid on velvet. This was a continuation of an interest in still life that Heade had developed since the 1860s. His earlier works in this genre typically depict a display of flowers arranged in an ornate vase of small or medium size on a cloth-covered table. Heade was the only 19th century American artist to create such an extensive body of work in both still life and landscape. 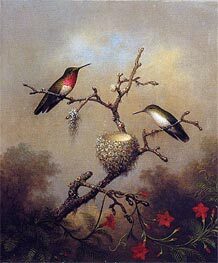 Heade was not a famous artist during his time, and for much of the first part of the 20th century was nearly forgotten. A re-awakening of interest in American 19th century art around World War II sparked new appreciation of his work, and art historians have come to consider him as one of the most important American artists of his generation. His works are in most major American museums, including the Museum of Fine Arts in Boston, Massachusetts, which owns the nation's outstanding collection of his works, including about thirty paintings as well as numerous drawings and sketchbooks; the Metropolitan Museum of Art in New York City; and the National Gallery of Art in Washington, D.C. In 1999 and 2000 he was the subject of a major exhibit organized by Theodore E. Stebbins, Jr., that travelled from the Museum of Fine Arts to the National Gallery of Art, ending at the Los Angeles County Museum of Art. In 2004, Heade was honored with a stamp from the U.S. Postal Service. As Stebbins notes in his writings, Heade's work has also been copied and forged extensively, though it should be noted that since Heade was not popular during his lifetime there were few contemporaries that emulated his work, so 20th century copies are readily apparent as fakes since it takes oil paint decades to dry out and harden.